PARIS --- France and Germany have agreed to fund general architecture and design studies for their future joint combat aircraft, French Armed Forces Minister Florence Parly tweeted yesterday, adding that this is “a decisive step forward” in the program. These contracts will be the first time the two countries have invested any meaningful funds in their future fighter since the project was unexpectedly announced in July 2017 by French President Emmanuel Macron and German Chancellor Angela Merkel. The two ministers have agreed the broad technical content, the schedule and the industrial architecture of the program, and this agreement will be translated into three contracts that will be signed between January and June 2019, Parly’s staffer said, adding that “2019 will be the year when the program coalesces by the award of the first contracts to industry.” He declined to state the value of the contracts, which are still being negotiated with industry. In January, Airbus Defence and Space for Germany and Dassault Aviation for France will be awarded a two-year contract for the SCAF architecture and design studies; French electronics firm Thales will also work on this contract alongside Airbus defense electronics units. This study will determine precisely the content of the SCAF system of systems, and also define the future fighter, its drone escorts and other “remote carrier” aircraft as well as how the platforms will network and interact. At the Paris Air Show in June 2019, the two demonstrator contracts are to be awarded to industry. The French Armed Forces Ministry says they will be awarded to teams led by Dassault for the aircraft and by France’s Safran for the engine; Airbus Defence and Space will work with Dassault while MTU Aero Engines will work alongside Safran on the engine. Even though it has agreed to the concept study, Germany has not agreed the terms of the two technology demonstration contracts, the German defense ministry spokesman said, so it is too early to say which country will lead them, and to which companies they will be awarded. “The demonstrator contracts are not part of Monday’s agreement” between the ministers, he said. “Neither their content nor their contractors have yet been agreed, and will have to be decided as part of the design phase,” he added. Spain has decided to join the SCAF program, and will sign the necessary paperwork by the end of the year, the Paris website La Tribune reported late Tuesday. Spain was hesitating between SCAF and the British Tempest project, Brigadier General Leon-Antonio Maches Michavila of the Spanish Air Force said at the IQPC International Fighter Conference in Berlin last week, according to Jane’s. "Something needs to happen [to develop a replacement for our current aircraft] sooner or later, but we want to be partners and not customers," Jane’s reported. "We need access to data and to provide our industrial capabilities. We are modest, but we know how to do things." The two governments have also agreed on new terminology for the program. 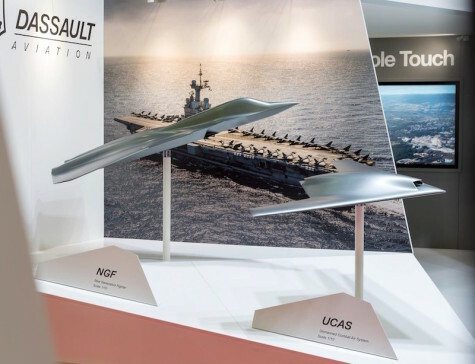 The new fighter is now designated New-Generation Fighter, as Dassault showed on a model at the Euronaval show in October, and together with its accompanying combat drones will form the New-Generation Weapon System (NGWS). This, in turn, will be integrated into the Future Combat Air Systems (SCAF in French) that will include ground radars, AWACS, tankers, drones and other support components.